Looking for a mentor for your Christian walk and/or marriage? Well, look no further! 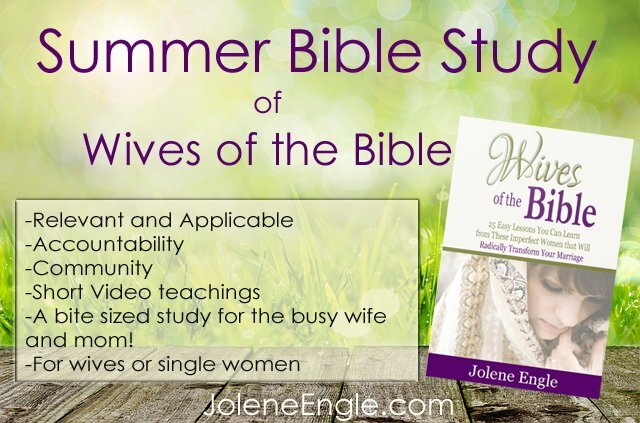 Coming to a computer screen near you is a bite size Bible study of the Wives of the Bible! When I was newly saved and single I had no older Christian women showing me how to be a Godly woman. But God, in His sovereignty knew what I longed for and needed, therefore He drew me to the women of the Bible so I could learn from them! Thus, many of them became my mentors. Now I want to pass on to you what they’ve passed on to me so you can put Christ at the center of your marriage! What are the good paths to pursue in your marriage and which ones you should avoid. How to take your marriage from good to great. Or from the dire straits to a joy-filled life! Gain some insights into your man. Or yourself! How to have a marriage that reflects Christ and the Church! If you’re a single woman and want to get a head start of laying a proper, biblical foundation for your future marriage, join in on the study! Better yet, grab a group of single women to join you. I can assure you you’ll receive great insight from the wives we’ll be discussing! In the study, I’ll be going deeper into the life of each wife I’ve written in my book, Wives of the Bible, and I’ll help you apply the Bible to your own marriage and walk with God. It’s a weekly study for 13 weeks. Each week I’ll be doing a short video teaching of 8-10 minutes. Since there are 25 wives in my book, I didn’t want to have a 25 week study, therefore, I’m discussing 2 wives per week. You’ll have a short study guide which will cover each wife in the book. I’ve made the study guide do-able, meaning, you’ll only be answering 10 questions or less on each wife. You can also expect an on-line community of this Bible study. If you’re on Facebook and you’d like to connect with other women and discuss the wives of the week, you can join my Facebook group here. Or you can gather up your girlfriends and do this study in real life, which, I believe would be great for your walk, after all, fellowship is a needed and biblical thing! What woman doesn’t need it? I made this Bible study manageable for the busy woman, wife, and mom so you can actually implement all that you’ve learned! When: The study will start Tuesday, June 17th. Make sure you subscribe to my site so you can receive future updates about the study. How to sign up: No sign ups are needed. In the coming weeks I’ll send out more information about the study as well as how you can get the study guide. If you’re doing the study strictly on-line, make sure you join my Facebook group: World-Changing Women & Wives. For Leaders: Start gathering up your girlfriends today! Or if you’re a mom with adult daughters, have them join you! I’m looking forward to connecting with you even more as we embark on this incredible journey of becoming world-changers in our marriages and in our communities! And will you share this with a friend?